Le 15 mars, la Société Générale a annoncé le lancement imminent de leur outils de gestion de budget intégré à la banque en ligne et ainsi bientôt disponible aux trois millions d'utilisateurs. Ce communiqué de presse insiste sur la co-création et le crowdsourcing, une dimension de plus en plus importante pour la SG qui a lancé au cours des 18 derniers mois des initiatives telles l''Appli' et sa 9ème fonctionalité crowdsourcée ou encore la capture de 20,000 feedbacks clients en agence via ipad. Avec cette approche, la Société Générale arrivera t-elle à créer un service de budget innovant et intuitif et à s'imposer sur ce sujet en France? Les thèmes du 'Personal Finance Management' (PFM), service de gestion de budget en ligne ou sur mobile, de l'aggrégation de comptes, et de l'ouverture bancaire font partie des sujets les plus discutés dans l'industrie bancaire à travers le monde. C'est aussi le cas en France où le marché a commencé à bouger l'année dernière, notamment grâce à un certain nombre d'acteurs tels Boursorama et son 'Money Center' en partenariat avec Yodlee, le succès des applis iphone du Crédit Agricole, de la Société Générale et de BNP Paribas, ainsi que le dynamisme de startups specialisées comme Linxo et Bankin'. Je vous invite à visionner mon interview filmée le mois dernier à Londres, une heure après Finovate Europe 2012, avec le Co-Foundateur de Bankin'. The company demoed its latest features focused on gamification and a deeper online banking integration. I invite you to watch my video with Meniga's CEO. Last week, I covered Finovate Europe 2012 live on the Visible Banking blog. At the end of another long day packed with innovative digital services and platforms, I managed to record a short interview with one of my favourite demoing companies, the IND Group. The hungary-based company demoed its new solution offering gamification within the online bank. Last night, I exchanged a few emails with Jon Gaskell - Co-Founder of Smartypig. Jon gave me the heads up and informed me of today's major announcements from the Des Moines-based leader in online goal-oriented social savings. For those of you who are not already familiar with the fun, engaging, social Smartypig service I invite you to watch my video interview with Bob Weinschenk - former CEO and Mike Ferrari - Co-Founder. In my opinion, Smartypig is today one of the very best examples of gamification in banking. Smartypig aka "The pig" is about to make several major announcements: a rebranding, a product launch, a new enagement model with an extended market -the whole worldwide financial services industry-. Le theme de la gestion de budget, Personal Finance Management (PFM) en anglais, est l'un des themes les plus presents dans les conversations liees aux medias sociaux et a l'innovation dans l'industrie bancaire. Mais peut-on reellement parler d'innovation? Peut-etre en France, certainement pas aux US. This year, NyKredit was again nominated for the EFMA social media award for their 'Saving Tips' crowdsourcing initiative: in only 2 months they gathered 400 tips 100% user generated, without any reward strategy or contest. The contribution came mainly from facebook & mobile. So please don't hesitate to call me (0044 7736 446 357), send me an email ([email protected]), or DM me (@Visible_Banking) to book a meeting and talk about twitter, facebook, customer reviews, social media & social commerce in banking, financial services and insurance. As you all know, I was very much looking forward to participate to my third finovate event. And what a day! Kudos to Jim Bruene, Eric Mattson , and the rest of their team for putting together such a smooth event with hardly no technical glitches. I invite you to check my wrap up on Visible Banking, add yourself to the list of tweeps @ FInovate09 (for those you attended the event), check the pictures and videos I shot at the event (and add yours) on the Visible Banking Facebook Page. I have been incredibly busy while staying in NYC. Indeed, I managed to shoot 16 video interviews between Monday 28th and Wednesday 30th September. I will be posting all of them on my blog soon. Stay tuned! If you can't wait to watch them, I invite you to visit my Dailymotion page and the Visible Banking Facebook page. Strands does an excellent job providing intuitive online tools and 'people powered' applications. I love their focus on people, the end-users. One of moneyStrands best achievements so far is to power BBVA's 'Tu Cuentas' online community. At Finovate they introduced their improved power search and their new partnership with savings.com to provide relevant online coupons and discounts to their users. Find more about moneystrands on their blog, follow them on twitter @moneyStrands, become a fan of their facebook page. It was a pleasure to meet the friendly Strands team in NYC, and catch up with Anna a couple of weeks ago at the 2nd BarCampBank Madrid. BBVA is one of Strands' investors and they had an exclusivity in Spain until the end of November. Anna was busy in Madrid so stay tuned, I am sure you will see more projects in Spain soon. moneystrands.es is now available. I invite you to watch my interview with Atakan. A big thanks to my sponsor for this US trip, Finroad the online community for Financial Markets professionals. Happy Birthday to Aaron Patzer, Founder & CEO at Mint.com! I love this picture of you Aaron. Thanks again for flagging it on your facebook page yesterday: "Don't quite know how the media found this picture of me for my Business Network interview..."
Not only Aaron looks strong (cf the picture) and wears green most of the time, cnn labeled him a hero last year, he is a great guy to hang around with. I had the pleasure to meet with Aaron several times in the US and I look forward to catching up with him in London soon. Aaron is a great inventor and also an outstanding entrepreneur a bit like his own hero Thomas Edison. He did an amazing job building in just a couple of years one of the most exciting, valuable, and successful services in the Online Finance world, Mint.com, recently acquired by Intuit for about $170 million. Aaron's vision for Mint: turn the savings rate for people under 40 from negative to positive taking the pain out of budgeting. Budgeting made easy. Simple yet brilliant and so needed. You can find Aaron on linkedin, on twitter, and obviously on google. Aaron shares his advice on how to build a successful business. * Step 2: Choose a market that's really, really big. * Step 3: Develop a business model that actually allows you to, well, make money. * Step 4: Don't pay to acquire customers. Ever. * Step 5: Be a compete stickler about who you hire. I invite you to check my post about Aaron's demo at Finovate 2009. I invite you to check my post about Aaron's demo at FinovateStartup08. I invite you to check my post about Aaron's demo at Finovate 2007. In just two years, Mint built an active user base of over 1,5 million people. Please find below the latest stats from compete.com. This is another best practice in blogging this time. 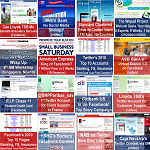 Aaron cleverly turned the Mint blog into an online magazine, one of the most valuable destinations for money tips online. It is now a profit center with many advertising deals in place. Mint has already over 38,000 passionate fans on its Facebook page. There is a lot of activity on the page. @Mint has over 21,000 followers on twitter. Mint recently launched Money Tweet to keep track of valuable tweets for the Mint community. There are currently 17 videos available on the Mint YouTube channel. I invite you to check the list of my video interviews with some of the most inspiring entrepreneurs in online finance and the social media champions in the finance industry. It seems like the SXSW '09 in Austin is the place to be this week... with of course the EFMA event on social media in Paris. I would have been delighted to participate to the interactive panel moderated by Aaron Patzer, Founder & CEO of Mint.com, 'Finance 2.0: Money Management to Save this Generation'. What a great line up: Michael Ferrari (smartypig.com), Aaron Patzer (Mint.com), Nichelle Stephens (KeepingNickels), Murali Subbarao (Billeo). I initially got in touch with Michael when I was working in Innovation at Lloyds TSB, I had the pleasure to interview both Aaron (twice) and Murali at a couple of Finovate events in the US. I look forward to catching up with them, and meeting with Nichelle, in San Francisco at FinovateStartup09. Mint became the fastest-growing personal finance software ever, reaching 1 million users in just 18 months. I invite you to read the excellent post "Three Principles of Personal Finance: All You Need to Know for Financial Success" Aaron wrote a few days before his consultation with the National Economic Council at the White House. SmartyPig, the leader in the social banking space, today announced the launch of its OFX Solution, enabling customers to add their SmartyPig accounts into their preferred money management sites. The integration syncs SmartyPig accounts directly into online account aggregators, including: Buxfer, Microsoft Money, Mint.com, MoneyStrands, Thrive, Wesabe and Yodlee. Geezeo and Rudder are coming soon. 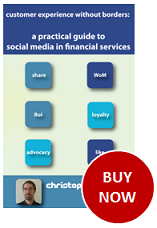 * People First: what are your expectations from social networking in banking?